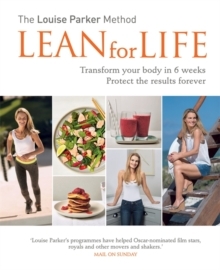 ‘Louise Parker, AKA the figure magician, has worked her magic on actors, athletes, pop stars, politicians and princesses and believes absolutely anyone can have a sensational body.’ Glamour ‘Louise Parker is one of the very few weight-loss experts worth the title. A genius method, an unbelievable client list and years of experience.’ Good Housekeeping ‘Clever, kind and committed to getting you the best body possible. Louise Parker really does think of everything.’ Tatler ‘Quite simply the most intelligent weight-loss programme out there.’ Independent It is not a diet – it is an inspiring, easy-to-follow programme for life, consisting of two phases: TRANSFORM – taking the direct route to your best body LIFESTYLE – protecting your results for life The method is the best-kept secret of A-list celebrities, royals, global CEOs, entrepreneurs and London society – the quickest, most do-able approach of total body and lifestyle transformation. It contains over 80 effortless recipes to help you ‘Eat Beautifully’ and avoid being ‘Organically Overweight’. Many of the recipes call for fewer than 8 ingredients and take just 8 minutes to prepare. For the first time, Louise shares her unique four-pronged approach to lasting success that has made her method the mecca for worldwide clients demanding the most intelligent, focused and practical solution to permanent weight loss and habit change.